Library Special Collections welcomes its third Ahmanson Research Fellow this fall, Lorenza Iannacci, who will study medieval documents in the Orsini family papers (Collection 902), specifically a “quaternus” of 1353, which contains the inventory of properties and feudal rights belonging to Napoleone I Orsini, count of Manoppello. The principal aim of her research is to produce a critical edition of the document, and to analyze it from different points of view: historical, paleographic, diplomatistic and codicological. Her work is part of a larger project in Italy undertaken by the Universities of Bologna, Napoli and Lecce and the Engineering School of Milano, Territory organization, land occupation and perception of the space in the Southern Middle Ages (XIIIth-XVth c.): digital systems for a new historical cartography. Through its participation in the project, the University of Bologna is studying and editing sources useful to define the feudal geography in Abruzzi --the Iustitiariatus Aprutii-- during the Angevin age (1266-1442). 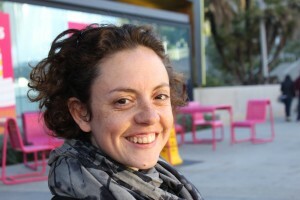 Lorenza received her degree in Modern Literature in 2005 from the University of Bologna; a part of her dissertation in Latin Paleography and Diplomatics, The cartulary of San Salvatore monastery: documents from 1012 to 1070, was published in 2012 as an essay in the journal Studi medievali. In 2005, she also completed her archival training at the School of Paleography, Diplomatics and Archival Sciences of the State Archive of Bologna. Lorenza has a Ph.D in Medieval History from the University of Bologna, where she wrote her dissertation on the 14th-century Italian jurist Giovanni da Legnano, producing a critical edition of his juridical tractate, the De pace. Since 2008 she has been editing 9th-century charters of Nonantola, Arezzo and Reggio Emilia for Urs Graf Verlag, publisher of the Chartae Latinae Antiquiores, 2nd series Ninth Century. As an expert on Latin paleography and diplomatics, she collaborates with faculty on the teaching of paleography and diplomatics at the University of Bologna; and from 2008 to 2012, she worked as a freelance archivist at banking foundations in Bologna. Lorenza has a post-doc fellowship at Department of History, Culture and Civilities of the University of Bologna. She is also an active member of the RAM (Research and Analysis of Manuscripts) Study Center of the University of Bologna (www.ram.unibo.it), and her research focuses on the study of documentary writings in Central and Northern Italy during the 9th through 12th centuries, the “chronicles-cartulary,” Angevin documentation, formularies in private acts, the Bolognese notarial school, and the inter-relationships of paleography, historical contexts, and legislation.